Worried about your first ever CORS Bidding as a freshman? NUS Psychology Society will be holding a ‘live’ coaching session just for you! We will teach you how to secure your modules for your first semester in NUS. Seniors will also share tips on the modules planning to make your university years more enjoyable! Come join us! Feel free to invite your friends along, especially if they are interested to major in Psychology as well! Seniors, we would appreciate if you can share this information to any of your beloved freshmen juniors in case they are not aware. Join us in our Freshmen CORS Bidding Assistance Session now! How to get here by NUS Shuttle Bus: Take A1 from Kent Ridge MRT Station Bus Stop, alight at the Bus Stop near AS5 (Refer to map below for more details!). Keen to know more about life after university? Worried about what you can do with a Psychology degree? Interested in internship opportunities? Come on down to NUS Psychology Academic Talks to find out more! Our annual talks see distinguished speakers from various fields of psychology coming down to share more with you about their field and what they do. This year, we have 5 exciting talks lined up for you from 11 Feb to 17 Feb 2014. Members have FREE access to ALL talks! Tickets will be available on a first-come-first-served basis so grab your tickets NOW! Upon successful sign up for the talks, you can collect your tickets on 4 Feb (Wed) and 5 Feb (Thurs) at Study Benches 19 – 20 (along AS1 Walkway)! Lab tours will allow you to see the inner functioning of the labs. This year, the Brain and Behavior Lab, Memory and Speech Lab, and Infant Lab will be open for a quick tour of the place and a sharing on the studies that can be conducted in the labs by research assistants. It will definitely be a good experience for those of you who wish to know more about the labs. 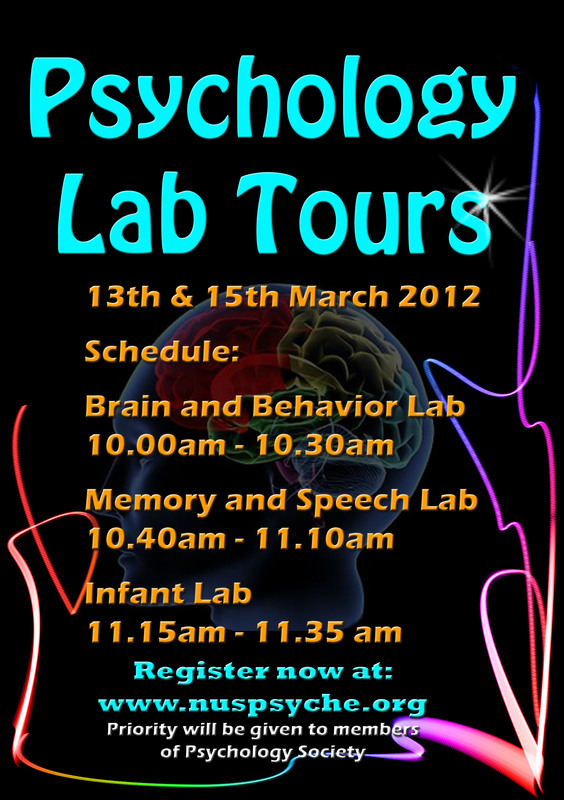 For more information on Lab Tours, feel free to contact Eugene and Camy at academics@nuspsyche.org for more details.